A vacation to Puerto Rico can be relaxing and carefree or vibrant and activity-filled. Regardless of your vacation agenda, you are sure to have an amazing time exploring this historic island. The diverse island, south of Florida, has 272 miles of coastline and a unique culture. Historic Old San Juan boasts Spanish Colonial architecture, spicy cuisine, and amazing shopping. In addition, the Condado Beach area is lined with glamorous resorts, offering a varied menu of water sports and vibrant nightclubs. Meanwhile, nature lovers will enjoy the inland El Yunque rainforest and its miles of walking and hiking trails that feature waterfalls and tropical foliage. This historic coastal neighborhood is a charming mix of narrow streets and lanes, ornate and formal Spanish colonial architecture, and interesting art galleries and boutiques. One of the most popular attractions in the seven-square block area is the Catedral de San Juan. Opened in 1540, it is graced with beautiful stained glass windows. The cathedral is also the final resting place of the explorer, Ponce de Leon. 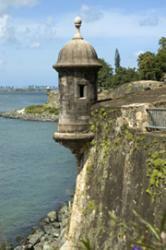 Castillo San Felipe del Morro, known as "El Morro," is located on a promontory jutting out into San Juan Harbor. The massive fort was continually built for over 200 years, and today visitors can explore its labyrinths of dungeons, turrets, barracks, and fortified walls. 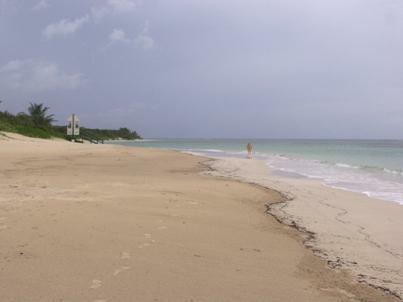 Condado Beach, a wide stretch of white sand, is lined with high-rise resort hotels and condos. Watersports abound here, and visitors can try windsurfing, para-sailing (with a view of historic Old San Juan), snorkeling, and deep-sea fishing. This is also San Juan's center for nightlife, casino gambling, and excellent restaurants. Ponce, on Puerto Rico's south coast, is the country's second largest city. It is ideal for travelers looking for a historic rather than a beach-related, Puerto Rico vacation. The area is filled with charming green spaces and sparkling sea views. It is also home to the Museo de Arte de Ponce, a museum filled with excellent examples of European and Latin American art. One of the best attractions in the Caribbean and a must-see on any Puerto Rico vacation is the Caribbean National Forest. Better known as "El Yunque," it's the only tropical forest in the U.S. National Forest Service. Preserved as such by President Theodore Roosevelt, this 28,000 acre park includes over 240 tree species, countless waterfalls, wild orchids, and the ever-present Puerto Rican coquí, or tree frog. Visitors can hike, climb, or relax with a picnic or a good book. Dorado, a luxury beach resort built around one of the best beaches on the island, is a great spot for a relaxed beach or golf-based trip. The two 18-hole championship golf courses are rated as the best in the Caribbean. The courses are carved out of the jungle and designed by legendary golf architect Robert Trent Jones. Caribe Hilton: Close to the airport, and between Condado and Old San Juan, this resort offers views of either the Atlantic Ocean or tropical gardens. The property includes a swim-up bar, a secluded beach, and a full-service Olas Spa and Health Club. Rincon Beach Resort: This upscale property offers either ocean view or pool side rooms, as well as two-bedroom villas. It's located 15 minutes away from the Puerto Rico's third largest city, Mayaguez. Rio Mar Beach Resort & Spa, a Wyndham Grand Resort: Located on 500 acres, this resort overlooks two golf courses, a pool, and the beach. The resort also includes a spa with fitness center, a tennis center, and a casino. Comfort Inn & Suites - Campomar: Located on the island of Levittown, Toa Baja City, the property is only 15 minutes from Old San Juan. Most of the guest rooms have balconies that overlook the Caribbean Sea. Embassy Suites Dorado Del Mar Beach & Golf Resort: This luxury resort includes an 18-hole golf course, three outdoor lagoon pools, and tennis courts. Each of the rooms is a two-room suite. Included in the rates are a cooked-to-order breakfast and an evening reception. Puerto Rico's dining scene isn't limited to Latino food choices. Rather, it features rich cuisine, whether it's a well-seasoned flank steak or a burger thrown on a grill. Aguaviva (Old San Juan): Decorated with three large jellyfish made of stained glass, this hip eatery serves seafood and ceviche. La Bombonera (Old San Juan): If you're eating on a budget, this restaurant/pastry shop is a good choice for traditional Puerto Rican dishes. Pikayo (Old San Juan): This restaurant offers a fusion of African, Spanish, Asian, and Indian cuisines. Zest (Water & Beach Club Hotel in Carolina): Headed by Chef Raúl Correa, this restaurant has earned the 2016 Diner's Choice award from OpenTable and a 2016 Certificate of Excellence from TripAdvisor. Lemongrass (Caribe Hilton in Condado section of San Juan): The eatery is known for its lemongrass cocktail and its "lemon sharing" menu. Puerto Rico means "rich port" in English, and with its popular tourist attractions, hotels and restaurants, it certainly makes good on that promise. No matter how you spend your vacation in Puerto Rico, it will likely involve ocean side views, and be rich in cultural wonders.